Summary: I was hyped with original Zenbook UX430 back when it was released, but a lot has changed in the meantime, and as of mid 2018 the Zenbook UX430UN is only a good buy if you can find it for a really great price. It's still a nice product, don't get me wrong, but it just looks better on paper than it behaves in real life, and it comes with a handful of compromises you'll have to accept. On top of that, there are many more viable competitors to consider these days than back in 2017. The article below explains this conclusion. 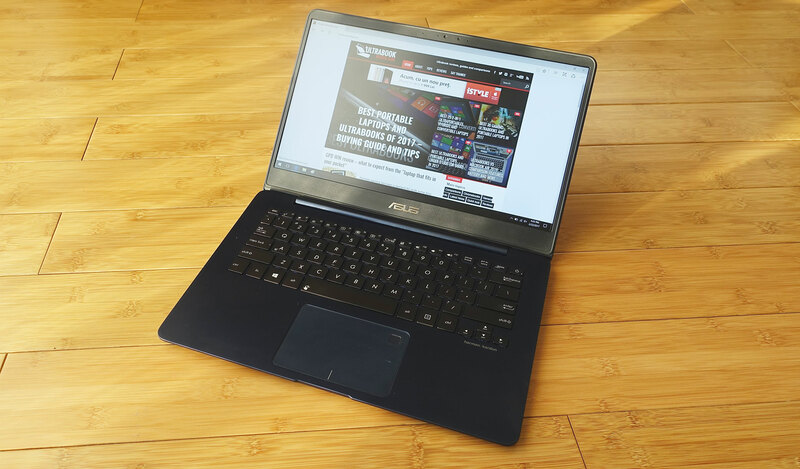 This article is very long due, but we finally get to talk about the updated models in the Asus ZenBook UX430 series of ultra-portables, the UX430UN model with Intel 8th gen hardware and Nvidia MX150 graphics. 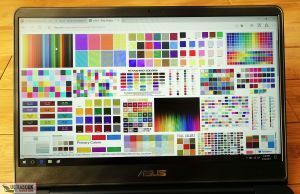 Keep in mind this article is published in August 2018 and not only analyzes the UX430UN for what it is, but also in comparison to the other computers you can these days with similar traits and within the same budget. 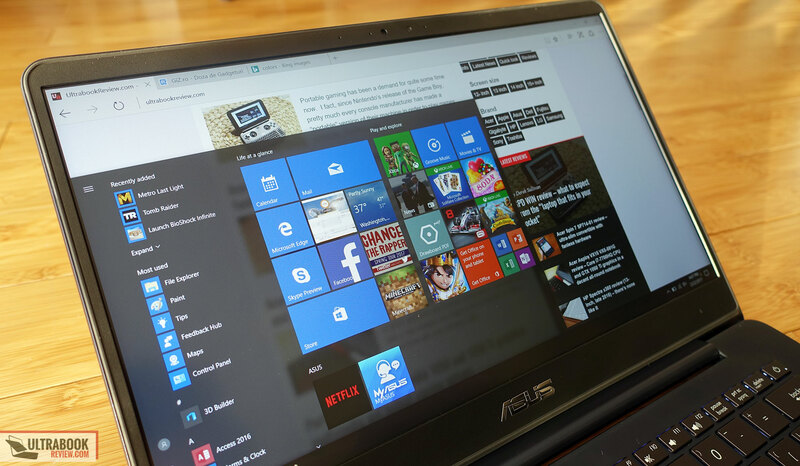 The Zenbook UX430UN is still at this point one of the few thin-and-light laptops out there that combine a nicely crafted and lightweight build with this kind of hardware in a fair priced package. On top of that, unlike some of the other ultraportables with MX150 graphics, this one actually gets the full-power version of the Nvidia chip, and not the Max-Q variant that’s present in most other options, which in theory should make it more compelling in games. 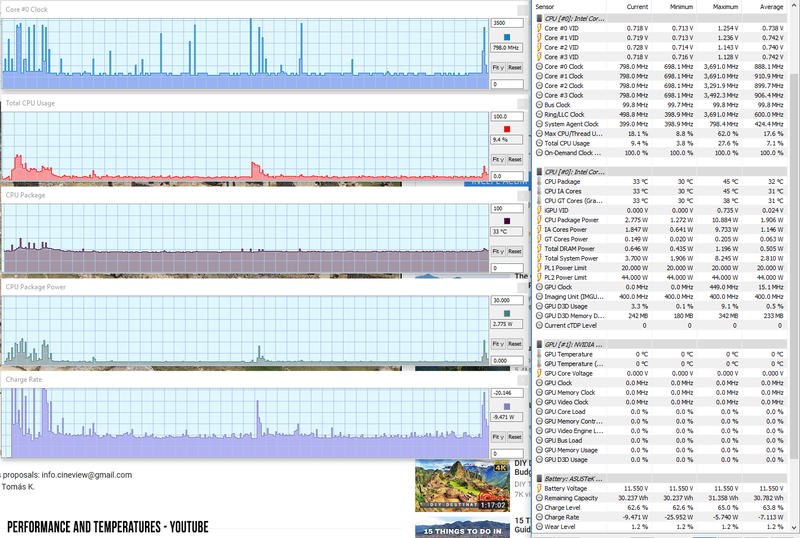 That however means that the Zenbook UX430UN is not for you if gaming is not one of your primary selection criteria. In this case you should rather opt for one of the many 8th gen ultraportables without a dGPU or even the few premium options with MX150 Max-Q graphics, with more compact builds, extra features or even more affordable prices. 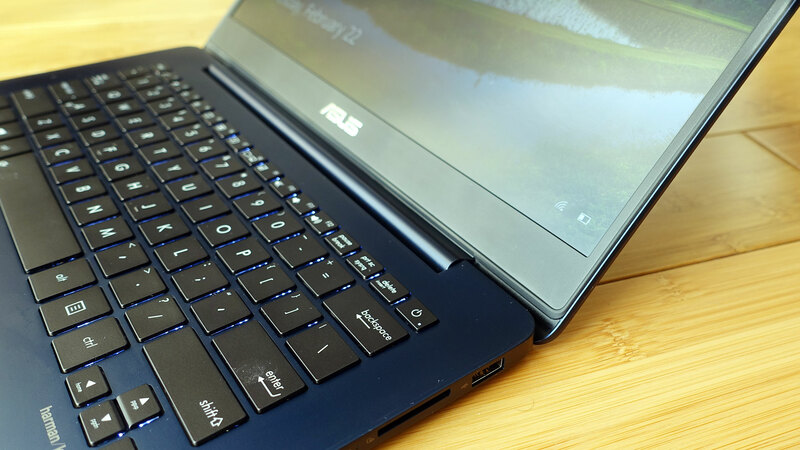 We’ve reviewed the Zenbook UX430 line in a previous in-depth article, and since nothing has changed on these updated versions in terms of design, build, IO and keyboard, we’re going to focus primarily on the updated aspects in this post. We’ll let you know what to expect from the screen, how this performs, how the hardware and cooling handle demanding loads, how much you can expect to get in terms of battery life, and how this ZenBook fairs against the competition as of August 2018. 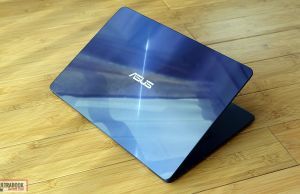 Asus also offer a Zenbook UX430UA configuration, identical to the one here, but without the Nvidia GPU. 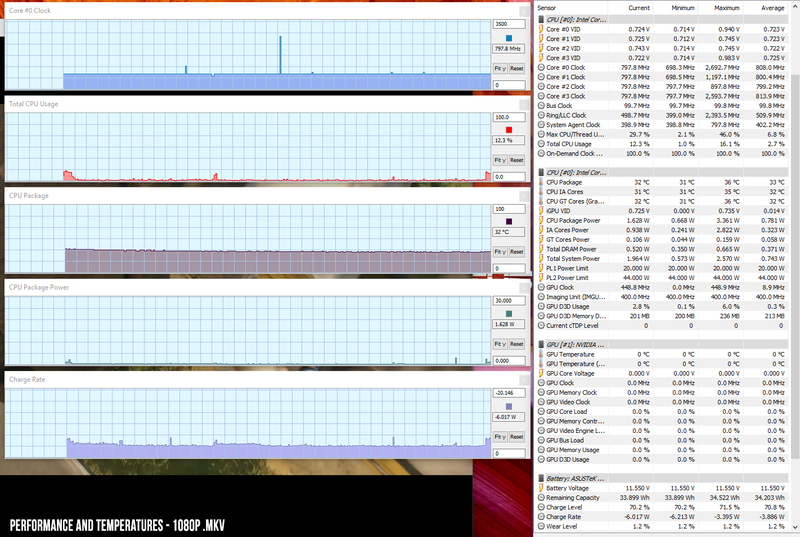 It’s more affordable, won’t offer the same performance in games and other applications that benefit from more powerful graphics, but also runs cooler is such tasks. Not much has changed with the updated models over the original UX430 series, so you should follow this link for our in-depth impressions on the design, build and practicality. 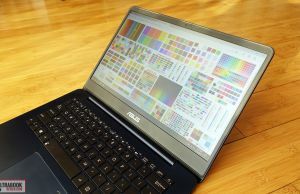 In very few words though, this is a compact and light computer with fairly thin bezels around its 14-inch display and a mostly metallic construction. 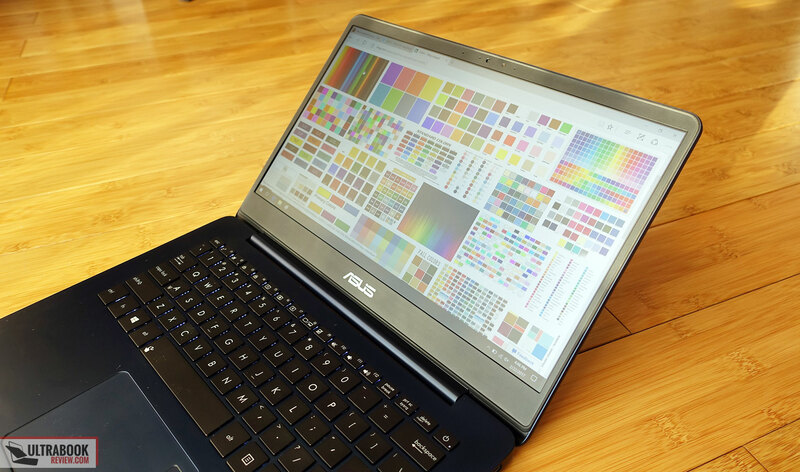 Asus offers it in a few different color schemes: the Quarts Gray model gets a brushed aluminum lid, while the Rose and Blue versions get a plastic-composite lid, which is both more flexible and more prone to showing smudges and scratches. That’s why I prefer the basic gray version, even if those other options look nice and are not as common on a modern laptop. 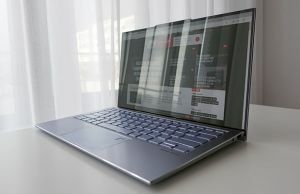 Aside from these aspects, the Zenbook UX430 is well made, albeit not as sturdy as a MacBook or other premium-tier ultraportbles, and also fairly practical (but I’d wish the screen would open past 145 degrees). The IO is pretty standard, but it shows that this is a an older concept, as there’s no Thunderbolt 3 support and only a mini-HDMI connector for video, so you’ll need to get an adapter on the side. 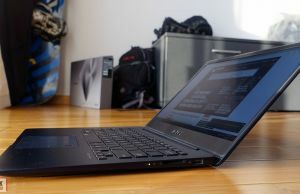 The Zenbook UX430 is a decent typer and the regular user out there should live with it just fine. Heavy typers and the pickier among you will however complain about the keys’ shallow feedback and the slight amount of flex in the keyboard deck. You’ll find more about our typing expereince with this laptop it in here. The trackpad is also OK, not the best out there, but for the most part accurate and responsive. Some people have been complaining about glitchy behavior on their units, which is either a QC issue with those particular variants, or perhaps they were using older drivers. The clickpad integrates a finger-sensor on some versions, and it works fine, but some of you might not appreciate its placement. The ZenBook UX430UN still gets a 14-inch display with matte finishing and fairly narrow plastic bezels around the sides (with about 80% screen-to-body ratio, it is part of our list of small-bezel laptops). 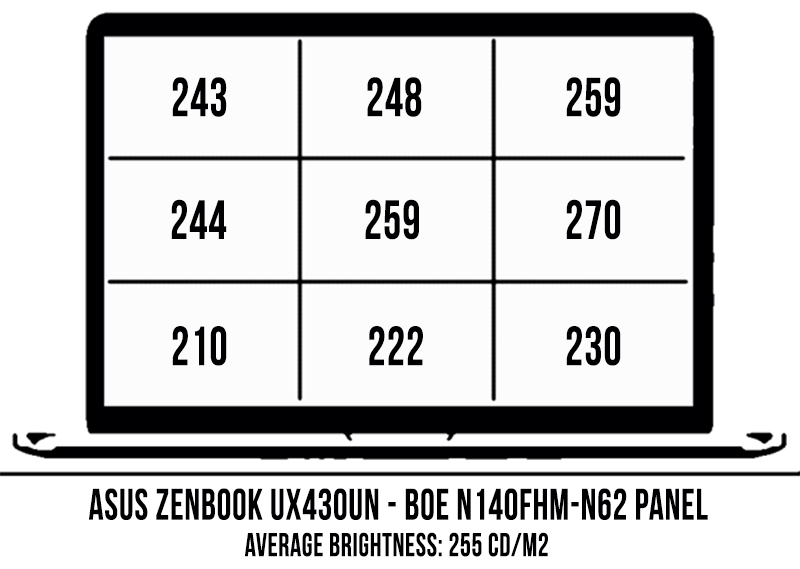 However, Asus uses a different IPS panel (made by BOE) on the UX430UN and UA models, not as nice as the Chi Mei panel we’ve previously seen on the UX430UQ variant or the one that’s bundled with the UX4340UN version available in Germany and a few other European countries. 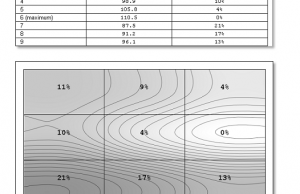 Pretty much all of its aspects are a step-down compared to the Chi Mei CMN14D2 panel, including the maximum brightness, contrast, color-coverage and uniformity, as you can see below (data recorded with a Spyder4 sensor). 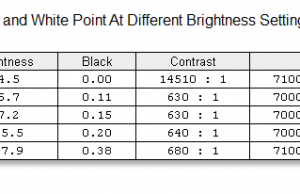 Black on max brightness: 0.38 cd/m2. 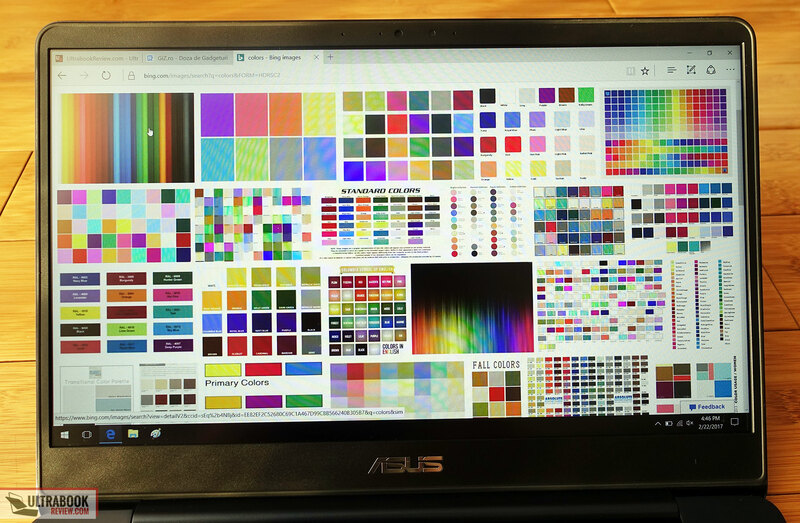 This is by no means a bad panel, but is merely an average option and a downgrade from what Asus put on the previous gen UX430UQ/UA variants. 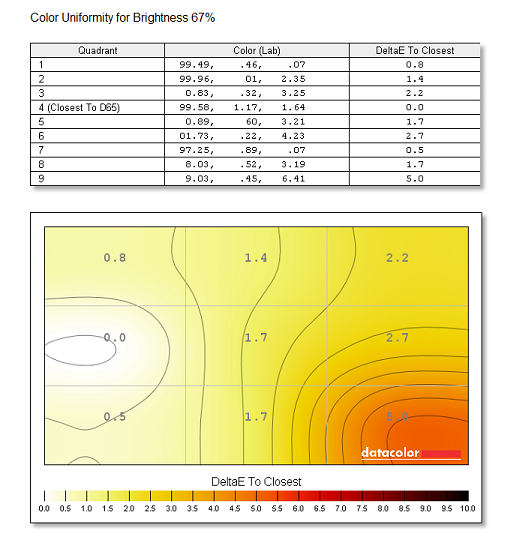 You can use our calibrated color profile to tweak some of the imbalances, but don’t expect wonders. On top of that, you should also know that this screen has a slow response time of around 40 ms BTW, and uses low-frequency (200 Hz) PWM modulation for brightness adjustments between 0 to 99%. 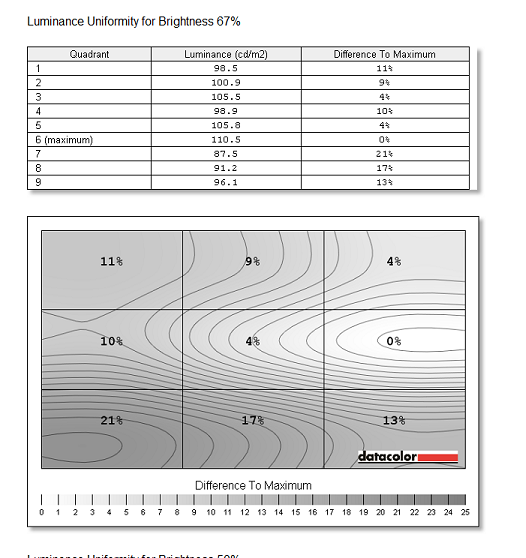 In other words, if you’re sensitive to flickering, you will notice it at any brightness levels except for 100%. 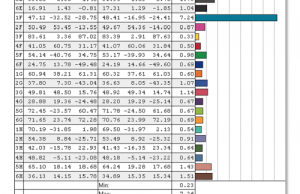 PWM is not something I’m personally bothered by much, so it’s up to you if its a deal-breaker or not. There’s is however a potential tweak that can address this: set the brightness to 100% and use a screen-dimming application to adjust the brightness from the software (details in here). 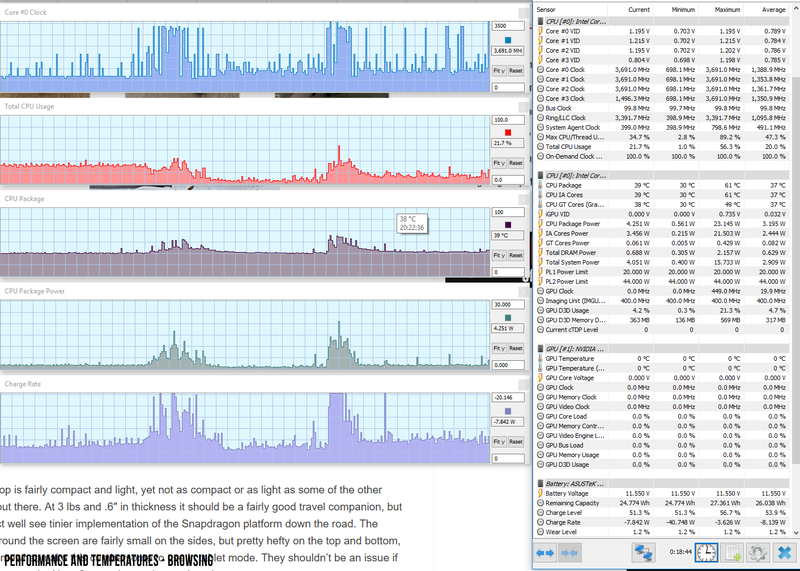 All in all, if you’re sensitive to flickering and don’t like the tweak above, the UX430UA/UN is not for you. The average user on the other hand should find this panel alright, especially if coming from an older laptop with a TN screen, so if there’s any way to see this in person before buying it, you should. 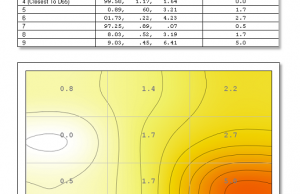 However, this conclusion changes entirely if you can find a configuration with the Chi Mei CMN14D2 panel, which doesn’t use PWM, gets faster response times and improved brightness, contrast and color coverage. Unfortunately though, the 8th gen updates of the UX430 series ship with the BOE screen in most regions. 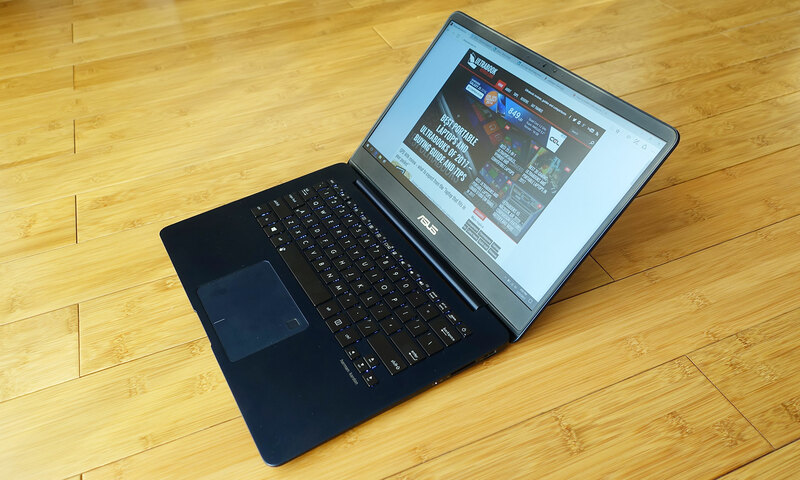 Our test model is a higher-end configuration of the Zenbook UX430UN, with a Core i7-8550U Kaby Lake-R processor, 16 GB of DDR3 RAM, a 256 GB M.2 SATA 3 SSD and dual graphics: Intel HD 620 and Nvidia MX150 2 GB, the 25 W version. Asus only sells this laptop with SATA M.2 storage, even for the 512 GB versions, but the M.2 slot supports PCIe SSDs if you need something faster, just keep in mind you’ll not get the full-speeds of a modern NMVe drive due to its older design (in few words, the M.2 slot is hooked through 4x PCIe 2.0 lanes, and not PCIe 3.0 lanes). 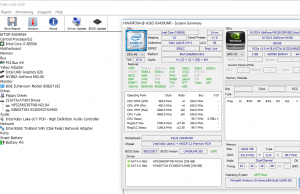 The SSD is upgradeable on this laptop, but the CPU, GPU and especially the RAM are not, so make sure you get what you need from the beginning. 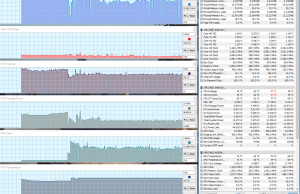 Asus only bundles the i7 configurations with 16 GB of memory in most areas, so you’ll be forced to reach for one of those if you want more than 8 GB. Important: A lot of people are complaining about coil whine on their UX430UNs, of which there was plenty on our review unit as well. There are a couple of suggested tweaks to address it, like switching the background to a black image, but replacing the SSD seems to be one of the most common fixes. Given this aspect and the fact that only SATA drives are offered out of the box, you should consider replacing the storage. Yes, spending extra for a PCIe SSD is difficult to accept on a brand new $1000+ laptop, as well as the whole hassle of reinstalling Windows and selling the SATA drive, but it is what it is. 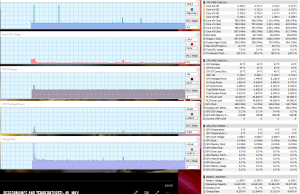 I mentioned in the beginning you should have this on your list if you’re interested in playing some games on such a computer, as otherwise you can find better value computers for browsing, movies and other basic tasks (which this can handle smoothly as well, of course, as you can see below). 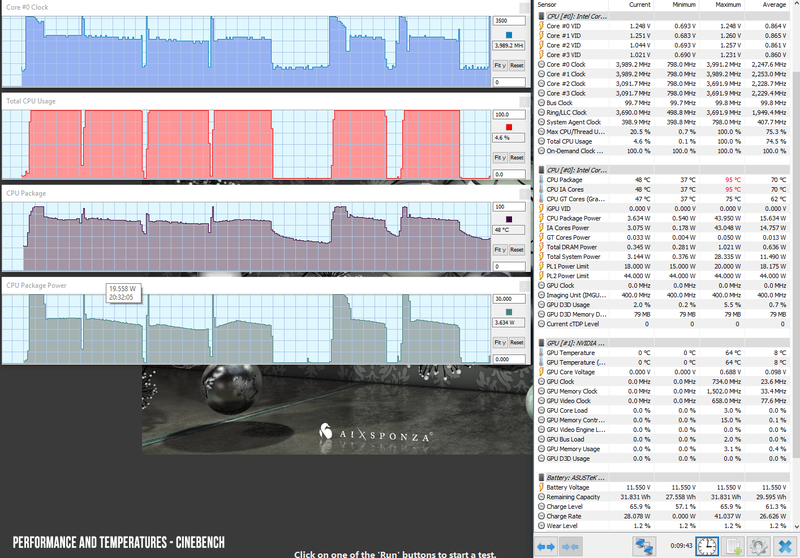 We simulate demanding tasks with the multi-core benchmark in Cinebench R15, which puts a 100% load on all the CPUs cores. As you can see below, our test unit performed much as expected from this kind of hardware inside a thin build, kicking-on strongly and then settling at around 2.2 GHz and a TDP of 15 W in multiple consecutive runs. 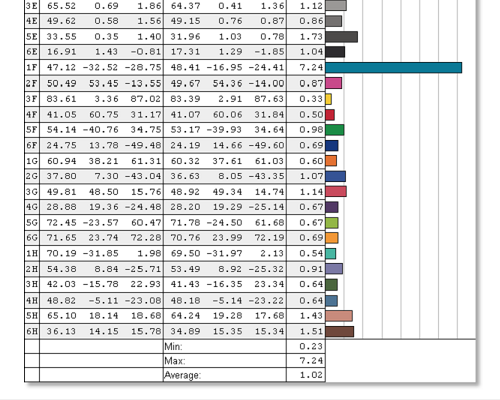 This translates in scores of around 610 points in the first run and around 530-550 points for the next runs. 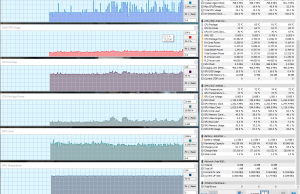 The logs shows how the CPU gets hot very quickly (95-96 Celsius) and clocks down in order to lower temperatures to about 75 Celsius, which is normal in order to prevent thermal issues, but the frequency cap is more aggressive than on other similar devices. 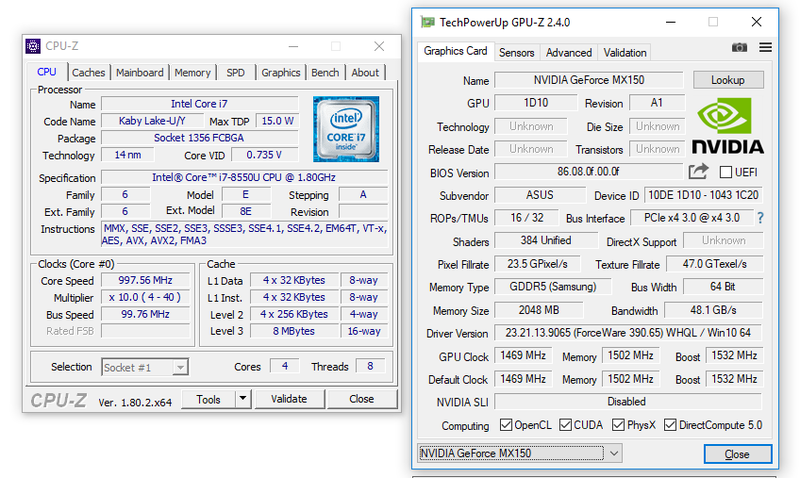 Undervolting should improve performance a fair bit, but we didn’t run Cinebench on the undervolted profile at the time of these tests and don’t have a log to show you. 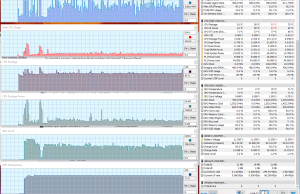 We did however run a handful of benchmarks on the default profile. 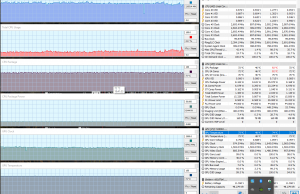 x264 HD Benchmark 4.0 32-bit: Pass 1 – 152.73 fps, Pass 2 – 34.54 fps. 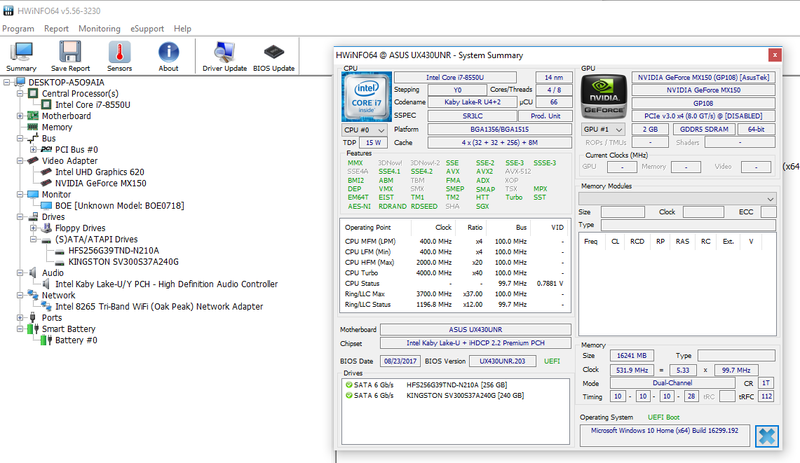 Now, as far as gaming goes, this laptop implements the full-voltage version of the Nvidia MX150 chip. 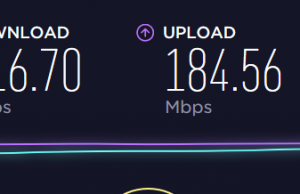 However, as some of the benchmarks results above suggest and especially the performance in actual-games prove, it cannot maintain its designed full-speeds. 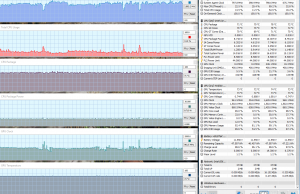 In other words, even if the ZenBook UX430 implements an MX150 version that should be around 25% faster than a 10W MX150 Max-Q implementation, in real life it performs about the same as a good Max-Q build. 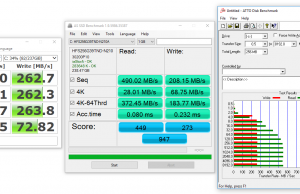 Below you’ll find the results we got on this UX430UN, side by side with the results recorded on the Zenbook UX331 (with the 10 W MX150 Max-Q graphics) and the Acer Swift 3 (with a 25 W version of the MX150 that runs at higher frequencies). 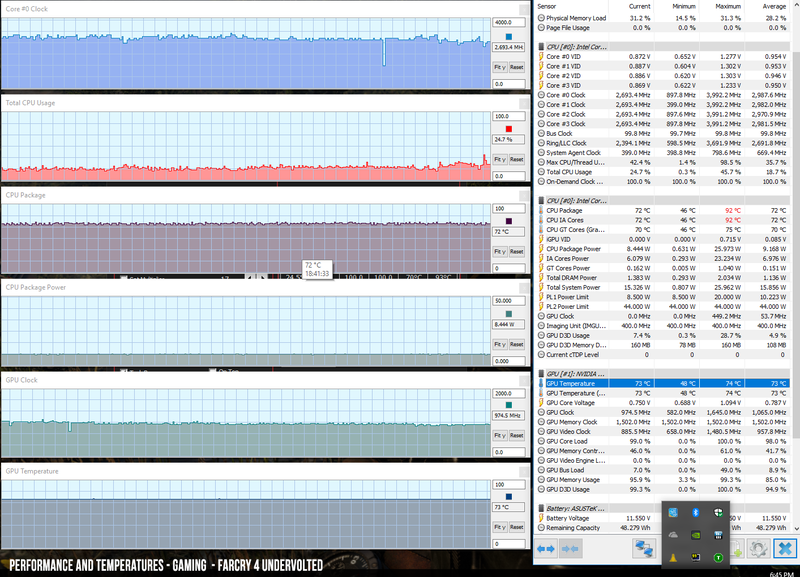 You’ll also find more info in the following HWinfo logs that show the CPU and GPU temperatures and frequencies with a few different games. 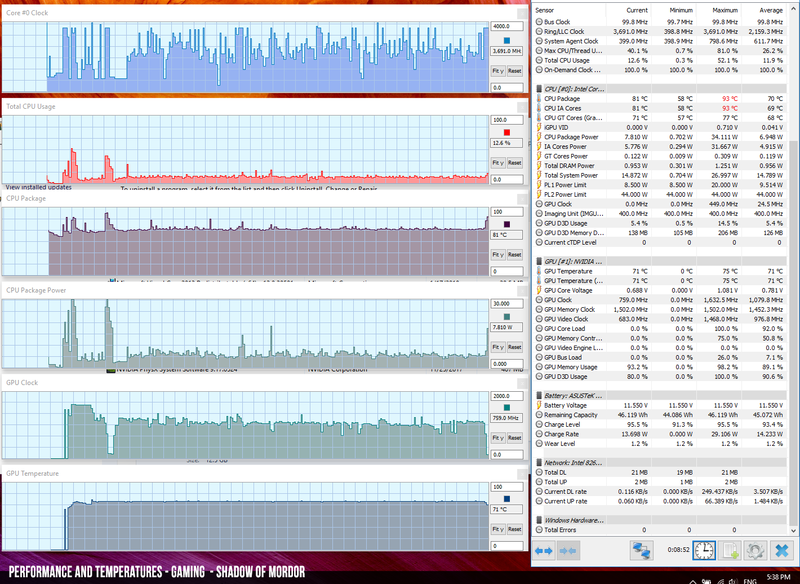 The CPU performs fairly well, it clocks down, but not to the point where it would bottleneck the experience. 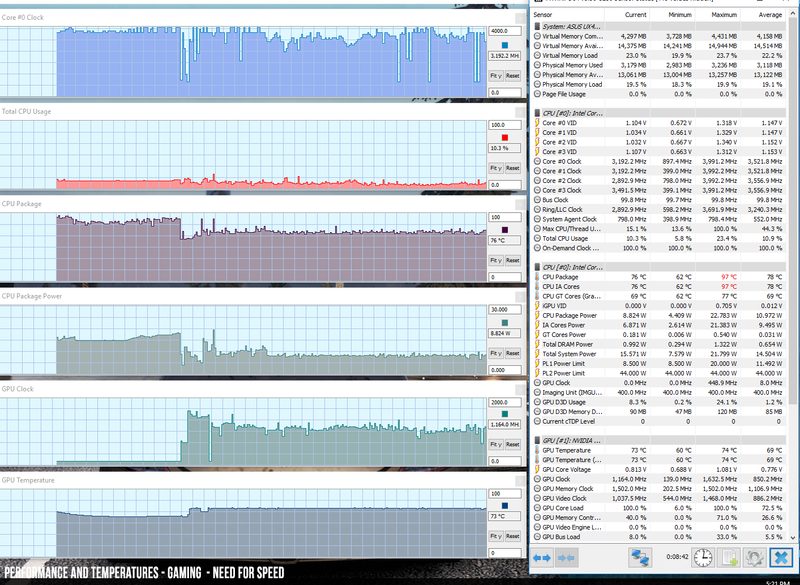 The GPU on the other hand clocks down aggressively quickly after launching a game, and only averages between 950 to 1100 MHz in our tests. On top of that, you’ll notice that both the CPU and the GPU are thermally capped at low temperatures of around 72-75 Celsius, which leads to the frequency limitations, while other OEMs set these thresholds higher on similar hardware in comparable thin-and-light implementations. It’s also important to mention that our test unit is a retail version, thus identical to what you can find in stores, but due to QC it is possible that some units will perform better than others. 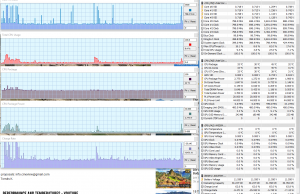 I noticed some people on the forums complain about stuttering while playing games on this laptop, and while we didn’t run into such issues on our version, that could also be explained by defective QC that lead to occasional abrupt drops of either CPU or GPU performance. But is there anything you do in order to improve performance? Well, not that much. 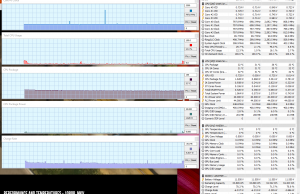 Undervolting the CPU should help a tiny bit, and repasting the CPU/GPU should lead to more noticeable results, but will void warranty. 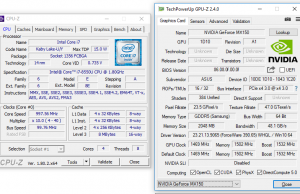 An updated BIOS that would allow the GPU to reach higher-temperatures is pretty much the only tweak that could allow this computer to reach its potential (or get closer to it), but since the UX430UN has been available in stores for 8+ months now, I’d expect it will never come. 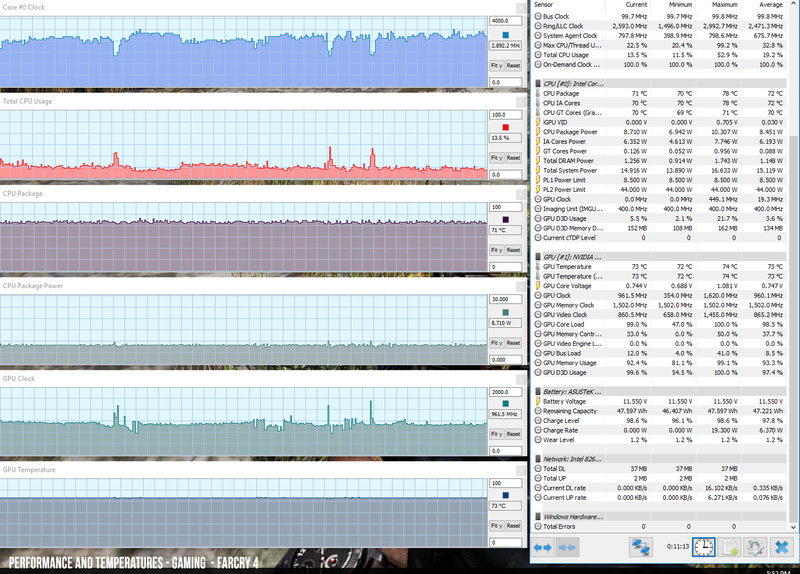 As it is right now, the GPU is capped at around 73 Celsius and the system lowers frequencies in order to keep it at this level. The components can withstand higher temperatures, and while increasing the limit would of course translate in higher case temperatures as well, I’d reckon potential buyers would accept temperatures in the low 50s on the belly and on top of the keyboard if that would put performance closer to what they expected when buying this computer. I’d reckon Asus went with these thermal limitations because they were afraid the cooling could not handle higher temperatures with the updated CPU and GPU. It is a standard solution for this kind of a thin laptop, with a single fan and a single heatpipe that runs on top both the CPU and GPU. 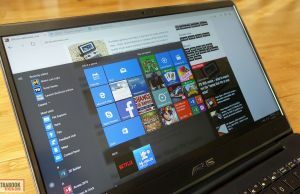 That’s similar to what Lenovo implements on the ThinPad T480s, but is nonetheless an older design compared to what you’ll find on more-recent devices with similar hardware like the Huawei Matebook X Pro, Asus ZenBook UX331 or the MSI Prestige PS42. 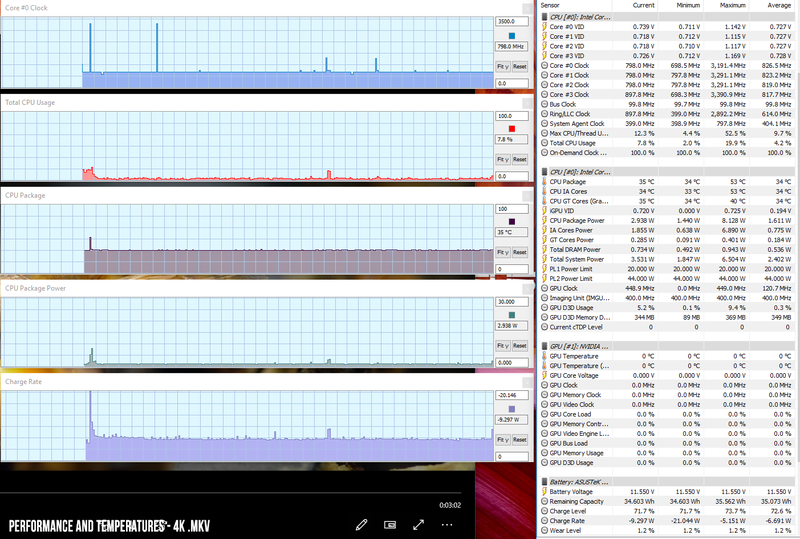 That aside though, the Zenbook UX430UN doesn’t get either hot or noisy. The fan remains mostly off with casual use, a nice change from the aggressive profile of the previous UX430UQ, and only kicks on with multitasking, but stays barely audible. You will however hear the annoying cool whine, and we’ve talked about it and some potential fixes in the previous section. With games the fan ramps up to about 42 dB, so you’ll hear it in a quiet room, but can be covered by the speakers. As far as temperatures go, here’s what we go on our unit. 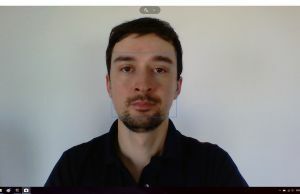 Not much has changed in terms of connectivity, speakers or the webcam. 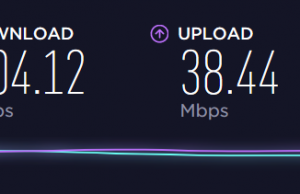 There’s wireless AC on this laptop and the connection works well, but is nor very fast or able to perform that well once you step away from the router, at 30 feet with two walls in between. 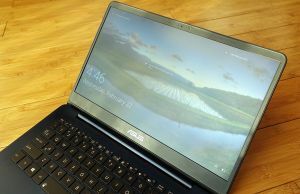 Modern laptops offer faster and more capable modules and antennae. The speakers on the other hand are fairly good. They’re louder than the average bunch, at about 82 dB at head-level, and the sound coming out is alright, with no distortions and limited vibrations. Of course, there’s still little on the low and high end, but the mids are good and overall these are definitely not bad for the class. 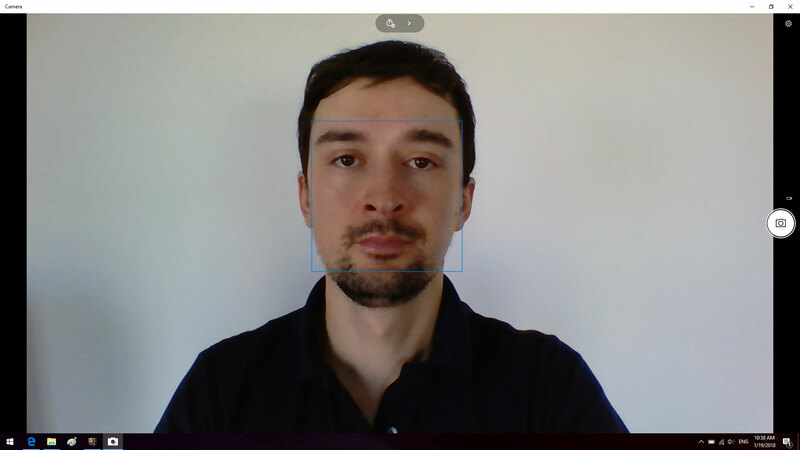 The webcam on the other hand is mediocre, but so are most others you can find on mid-range laptops these days. Should do fine in good light, but it will struggle badly in dimmer places. 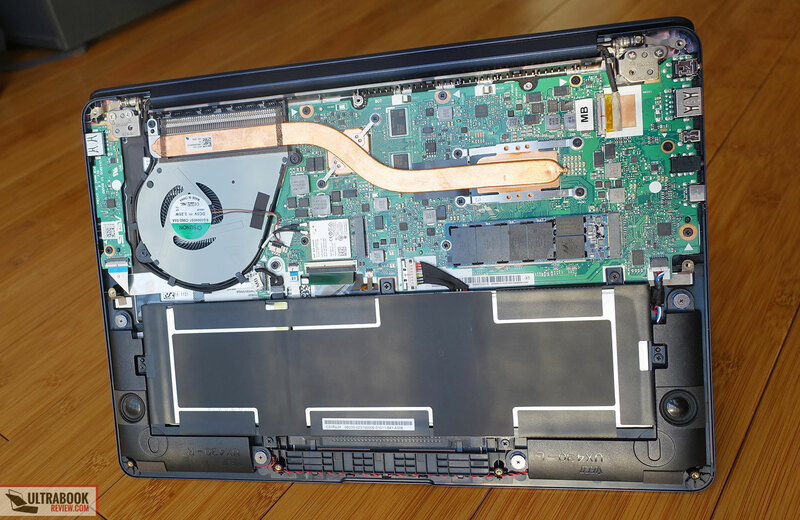 There’s a 50 Wh battery inside the Zenbook UX430UN and that’s not bad for the time the original UX430 series was released back in early 2017, but not that great as of the middle of 2018. Paired with the efficient hardware and economic screen, this won’t disappoint though. 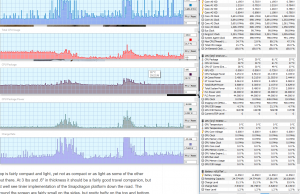 Here’s what to expect, with the screen’s brightness set at 40%, around 120 nits. 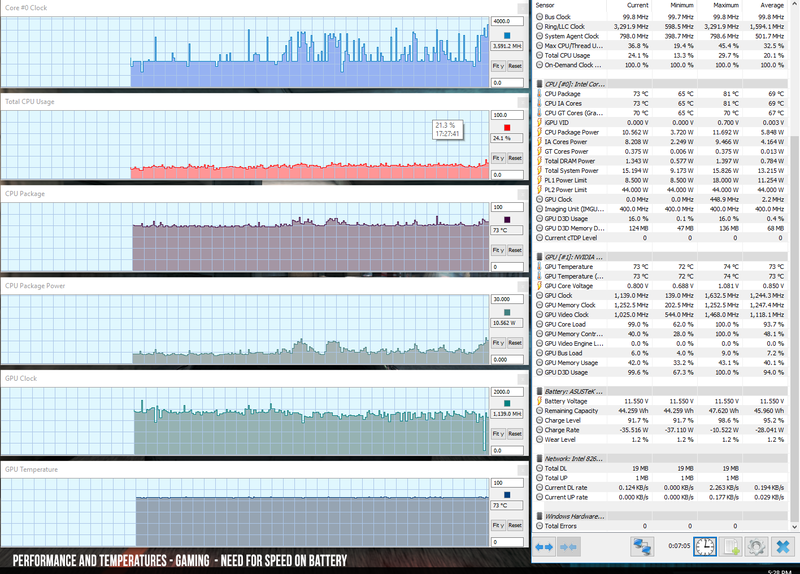 9.5 W (~5 h min of use) – heavy browsing in Edge, Balanced Mode, screen at 40%, Wi-Fi ON. This laptop comes with a 65 Wh charger without any kind of quick-charging, and a full-recharge takes around 2 hours and 15 minutes. 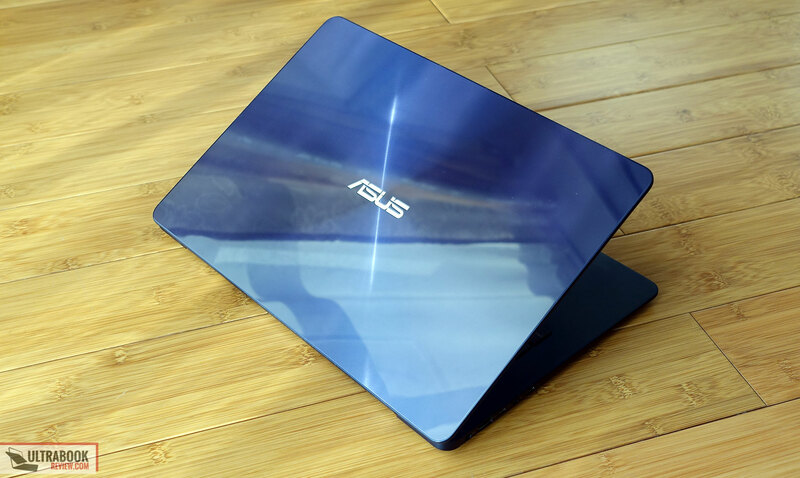 The Zenbook UX430 series is available all around the world at the time of this post. 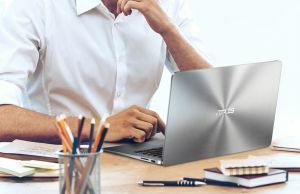 However, Asus mostly offers the UX430UN versions with the Core i7 CPU, 16 GB of RAM and a 512 GB SSD, and you’ll hardly find lower end versions unless you’re willing to skip on the Nvidia MX150 chip. 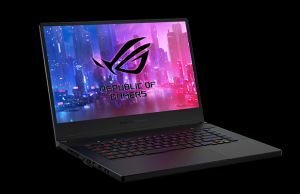 As of mid-2018, those higher-end configurations sell for around $1150 in the US and around 1200 EUR in Europe, while the UX430UA models with a Core i5 processor, 8 GB of RAM and 256 GB of storage start at under $1000. I was excited about the UX430UN back when we tested the original version in the first part of 2017. 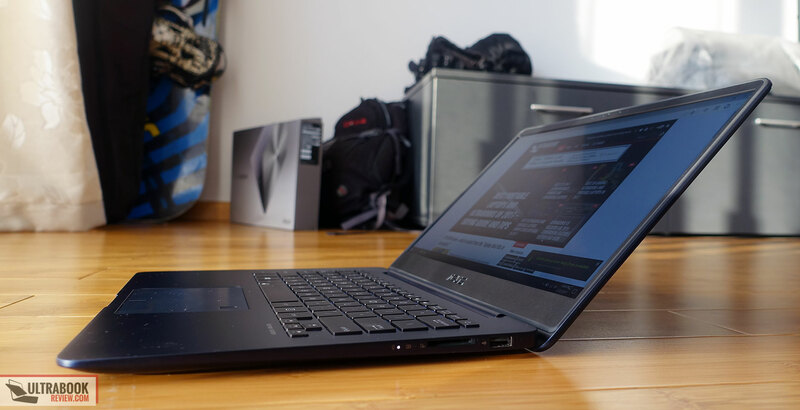 It had its share of drawbacks, but overall it was a great little laptop and there were very few others that could offer the same versatility and the ability to play games in such a small package. 15 months later, judging by the tone of the previous paragraph, you might have guessed I no longer feel the same way about the UX430UN update. In all fairness, this is an old model at the time of this long-delayed article (August 2018) and there’s a good chance you can find it greatly discounted, which would make it a solid value buy, but you’d still have to accept plenty of compromises compared to the alternatives released in the meantime. the MSI Prestige PS42 – a newer launch with a compact and light build, full-voltage MX150 graphics and a complex cooling system. 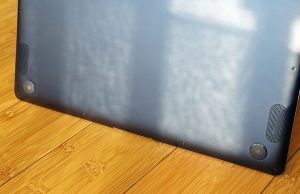 Each have their fair share of pros and quirks, so I’m not saying these are necessarily better buys, I’m just saying you should also check these out and see if they offer better value for your needs and budget. All in all, it’s hard to recommend the Zenbook UX430UN anymore unless you can find it for a really good price, and even at that point you’d still have to accept the limitations. 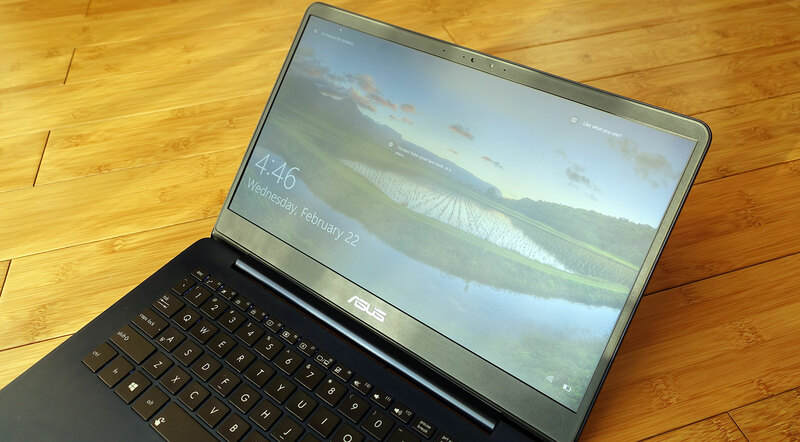 That’s about it for our review of the Zenbook UX430UN. The comments section below is open for discussions, feedback and questions, so don’t hesitate to get in touch. Costco currently (January 16, 2019) has the Asus UX430UN for $899, what do you consider a "good price"?